The Brighter Side of Day is not just a show. It's a spellbinding musical experience where Kathy Sledge channels the inimitable style and unmistakable voice of Billie Holiday, propelling audiences to the music of the 1940s. Accompanied by jazz combo Somebody Tell Joe and the Chops Horns, Kathy immerses the crowd in the music of a groundbreaking era while casting a bright light on an artist whose voice defined a generation. Grammy-nominated icon Kathy Sledge tells the heartfelt story of four sisters who brought the world together as a family at the expense of almost losing their own. Packed with her gripping, unforgettable memories, plus live performances of anthems like "We Are Family," "He's the Greatest Dancer," and other worldwide hits, Kathy shares the life and musical legacy of Sister Sledge in this up close and personal celebration of the group's extraordinary life on the world stage. 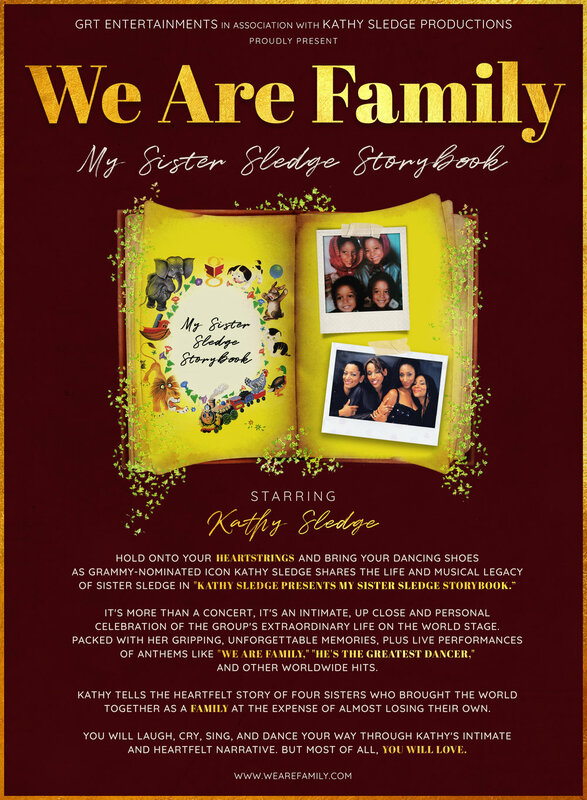 Kathy Sledge, the legendary voice of "We Are Family," and her daughter, actress and fashion forward stylist Kristen Gabrielle reinvent, re-create, and re-purpose the world-renowned "We Are Family" brand for the next generation of Sledge luminaries. Every episode in this scripted reality show / docudrama offers an exclusive glimpse behind one of the most legendary families in music, showing the world that it’s theWE that matters most in WE ARE FAMILY. Kathy Sledge's dynamism as a live performer is the heart of "Kathy Sledge presents: My Sisters & Me," a concert series that features Kathy alongside other "sisters in song" who've had iconic hits that stand the test of time. Kathy successfully launched the first "classic edition" of My Sisters & Me with classic artists Deniece Williams, Karyn White, and CeCe Peniston, and will include a rotating roster of artists from different musical genres in future presentations of the series.